Summer's just around the corner, and in some parts of the country it's already here. Are you prepared for smart horsekeeping through the hottest part of the year? For expert advice, we spoke with Adam Cayot, DVM, one of the veterinarians at Peterson & Smith Equine Hospital in Ocala, Florida. Cayot showed hunter/jumpers for over a decade and has a special interest in equine sports medicine. In addition to being in the heart of horse country, Ocala's location has given Cayot plenty of experience in dealing with all the challenges summer can present to horse owners. Cayot points out that keeping horses comfortable and well-hydrated is always better than trying to cool down an overheated horse. Having shade and the opportunity to get out of the sun and heat is crucial. If possible, Cayot recommends bringing horses into the barn so they can be under a fan during the hottest part of the day. If this is not an option, be sure they have plenty of shade outside and set up a water mister in the paddock so horses can cool themselves off whenever they like. The average 1,000-pound horse requires about five gallons of water per day, but may drink much more than that during hot weather. Do everything possible to keep your horse hydrated. Provide access to clean, cool, fresh water at all times. Empty and scrub water buckets and tubs regularly to prevent algae, which can grow rapidly once the weather warms up. Free choice salt should always be available; adding powdered electrolytes to your horse's feed helps replace minerals lost through sweating and encourages water consumption. Some people add electrolytes to the horse's water, but this can actually discourage water intake if the horse doesn't want the flavored water. If you put electrolytes in a water bucket, Cayot always advises offering an additional plain water option so the horse has a choice. An easy way to get electrolytes into a horse immediately is by using an electrolyte product in paste form, which comes in a syringe similar to a paste dewormer syringe. 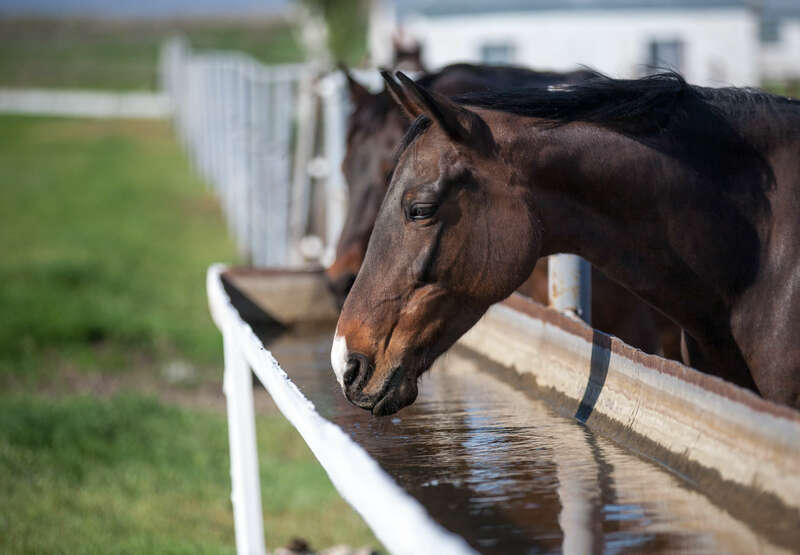 Horses must drink to stay hydrated, so if you're on a long ride, plan it so your horse can drink along the way. If you're trailering somewhere to ride or compete, bringing a container(s) with water from home will encourage consumption since it will taste familiar. You may have heard the persistent old wive's tale that says hot horses shouldn't be allowed to drink. "There's no science behind this saying of not letting a hot horse drink," notes Cayot, adding that he has never treated a horse for colic due to being hot and drinking water. "Horses need to drink to rehydrate, but don't let them drink a whole five-gallon bucket at once. Just offer water every few minutes when you're cooling them down so they drink smaller amounts." Here's a basic guideline to follow: If your horse is hot simply because it's hot outside, he can drink as much water as he wants. If he’s hot because of exercise, allow him to drink small amounts gradually over a period of 30 minutes to one hour as you take steps to decrease his body temperature and walk him during the cooling-off process. "If it's uncomfortable for you, it's uncomfortable for your horse," adds Cayot. Be realistic about your horse's age, condition and fitness level. "A fit horse can handle hot-weather exercise, as long as he's sweating and well-hydrated," notes Cayot. 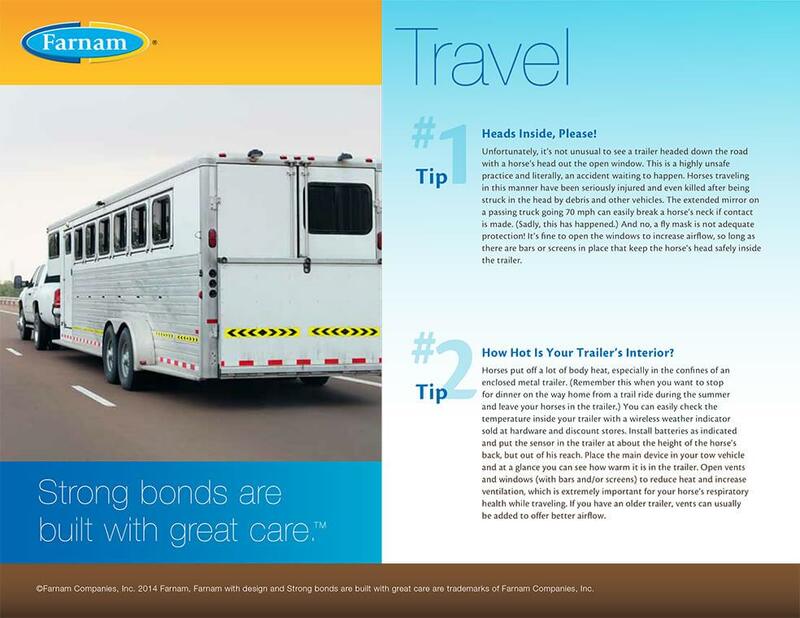 Although it's tempting to plan a long summer trail ride with friends	, Cayot warns that this can be dangerous if your horse is not in good shape. An unfit horse is much more prone to overheating when exercised in hot weather. Pay attention to the heat index. (With the various weather websites and apps available, this is easy to do with your smartphone.) A simple tip to remember is that the higher the heat index, the less effectively your horse — even when he's fit — can cool himself by sweating. Avoid riding during the heat of the day and when the heat index rises. The average temperature for an adult horse is between 97.5°F and 101°F, but do you know your horse's normal temperature? Some horses run "colder" or "hotter" than average, and environmental factors can affect a horse's temperature by as much as three degrees, so it’s important to take your horse's temperature often enough that you know what’s normal for him. This makes it easier to monitor his body temperature during extremely hot weather. Be observant. Is your horse breathing more rapidly than his stable mates or pasture buddies? Is he sweating normally? Anhidrosis (the complete or partial inability to sweat) is a common problem in regions where summer brings high heat and humidity. "Anhidrosis is a big concern and we still can't determine exactly what causes this," notes Cayot. "A horse can stop sweating from one day to the next, and typically the horses who become anhidrotic were once prolific sweaters. It's very important to look at your horses daily. "If all the other horses are sweating and one is barely sweating or not at all, this is a big alarm that something is wrong. When a horse is panting (rapid breathing) and his skin is dry when other horses are sweating, this can be a veterinary emergency. "Take the horse's temperature. High normal is 101°F, but when a horse isn't sweating, his temperature can get to 105°F or higher, which is an emergency. The horse can die if this is not addressed right away." If you suspect overheating, either because the horse isn't sweating normally or is overly hot from exercise or weather, you need to take immediate steps to cool him down. Get the horse into the shade and use a hose to run cool water over his body, focusing on areas where large veins are close to the skin surface, such as inside the back legs and along the neck. Placing packs of crushed ice on these blood vessels will also help drop his body temperature. If possible, stand him in front of a fan while hosing him off. Use a scraper to remove the water throughout the process because the water will heat up rapidly and can make him hotter. "That layer of water is like a wet suit for a diver,” Cayot explains. “Once water gets in the wet suit, it warms up fast and insulates you. It's the same thing with water on a hot horse, so keep it running and keep scraping it off. It's the evaporation of water that cools the horse off." Pouring rubbing alcohol over the back of a hot horse will also help cool him down because alcohol evaporates quickly. If you notice any of these symptoms, consider it an emergency and contact your veterinarian immediately. Continue your efforts to cool down the horse until help arrives. Even if the horse is responding favorably to your efforts, he should still be evaluated by a veterinarian. Intravenous (IV) fluids may need to be administered to replace lost electrolytes and help him rehydrate.